Building a division is hard work, no one can deny that fact. Building up the women’s division has taken a lot of effort and it has taken tremendous talent within these past few years. With it still being a very male dominated society and business, there is still a constant search for the yellow-brick road to find gender equality. With WWE’s first all women’s pay per view Evolution just around the corner, there have been several rumors of WWE reintroducing Women Tag Team Titles. The company has not had Women’s Tag Team Championships for nearly 30 years. Tag teams in the men’s division are spotlighted on both RAW and SmackDown. This year we have had some solid women tag teams emerge, and some others that they seem to have just been thrown together. The real question though after 30 years, are we ready? Right after Stephanie McMahon made the announcement for the Evolution PPV in July, a buzz started circulating on the potential women’s tag team championship. In an interview with Sky Sports, McMahon described her future hopes of the Women Tag Team Titles. She stated, “Not quite yet but that’s absolutely something we’ve heard loud and clear from our fan base and it’s something we’re keen on implementing as soon as we are able to.” This reasoning could be because the main roster needs to see an increase in the amount of women they have before this is implemented. Of course, as women wrestling fans, we all want the most opportunities and the best for our favorites. Is the best time now though? Although creating tag team titles would help solidify the women division, there is a question looming, are there enough women on the main roster to have this title come to fruition? The current RAW roster has 16 women on it and the current SmackDown roster has 11. As we know with the men’s tag team division, if they only have the same four teams over and over again, it can lose its appeal and the division can become quite stale. Let’s take a look at how both RAW and SmackDown square up for potential tag teams. Let’s look into what is arguably now the “B” show, RAW. There is really only three definitive teams on this brand at this moment. The Bella Twins are the most recognizable and who have the longest longevity, however, they just returned full time. They have been feuding since they have returned with the other active tag team on the RAW brand which is the Riott Squad. The Riott Squad debuted on SmackDown last November and then earlier this year, they were drafted to RAW. They have continued their attack through the RAW roster even when Ruby Riott was out with an injury. Other than these two consistent teams there is Alexa Bliss with Mickie James or Alicia Fox. Although Bliss is often seen having James and Fox in her corner, they don’t always have tag team matches together. With the announcement that Bliss and James are now teaming up to face Lita and Trish Stratus at the Evolution PPV, this may solidify their mark as the head of the tag team division if that is where they want them to head to. Both women are multiple Women’s Champions and with James not having any title wins since returning to WWE in late 2016, it would be nice if she was one half of the inaugural tag team champions. Recently we have seen an attempt to put together random single wrestlers together such as Nia Jax and Ember Moon. These two have seemingly just been added together, however they do have a history as Jax was the one to introduce Moon on her debut to RAW from NXT back in April. Lastly, we have the Boss and Hug connection. The “are they friends, or are they not friends” seems to have ended and they seem to be a team. The will they or wont they may have stopped because they are being prepped for tag team gold. Next, let’s take a look at the teams that we have on SmackDown. There are technically three teams on the blue brand right now. There are the underused former Absolution members Sonya Deville and Mandy Rose. They are not used every week and when they are used, there is no clear storyline or feud for them. We also have the IIconics, and although they have been used in the past several weeks, they normally do not pick up many wins. They have been on the losing end of the newest team on SmackDown which is Naomi and Asuka. Asuka came to help out Naomi against the IIconics but now that the Super Show-down PPV is over, will they still stay together? In a WWE Exclusive from last week’s Smackdown, we saw Carmella come to Lana‘s aide in the locker room after a verbal assault by Deville/Rose and the IIconics. This could be a hint at trying these two as a tag team. A perfect way to introduce some new teams to the main roster could be with some call ups from NXT. Like we had in November of last year, Paige came back from injury with Rose and Deville. Even though they have not been used a lot lately, they are one of the solid teams they have on SmackDown. The other call ups were the Riott Squad when they were in a backstage segment that involved an attack on Naomi and Becky Lynch. The Riott Squad have made a name for themselves and certainly have been present weekly on RAW. Perhaps another round of call ups around or after Survivor Series of a few NXT Superstars may strengthen the tag team ground. With the announcement of the Battle Royal for the Evolution PPV this week, which seems to just have every other woman who doesn’t have their own match thrown into it, the chance of a match for the tag titles for the women now seems less likely. However, the announcement of the titles could still be made and maybe we will get a tournament of some type of this later on in the year or even leading up to the Royal Rumble? And one final question that can be addressed is will we have tag titles for each brand or does that go without saying? 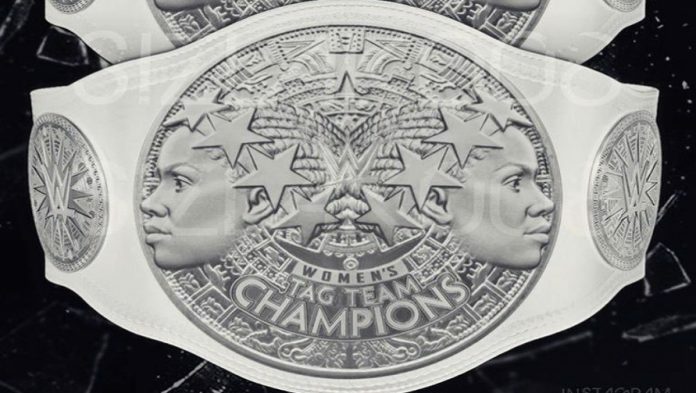 What do you think of the potential women tag team titles being implemented? Do you think the women should have more titles to go for? Maybe if not tag titles, how about a midcard title? Do you think now is the time to have new titles or should they hold off until later? Sound off in the comments below! !